He made it with lemons that he had first used to make Elderflower Cordial. My parents have an elderflower tree in their backyard, and occasionally my dad makes cordial from it. He keeps it in the freezer, and likes to drink it with gin. 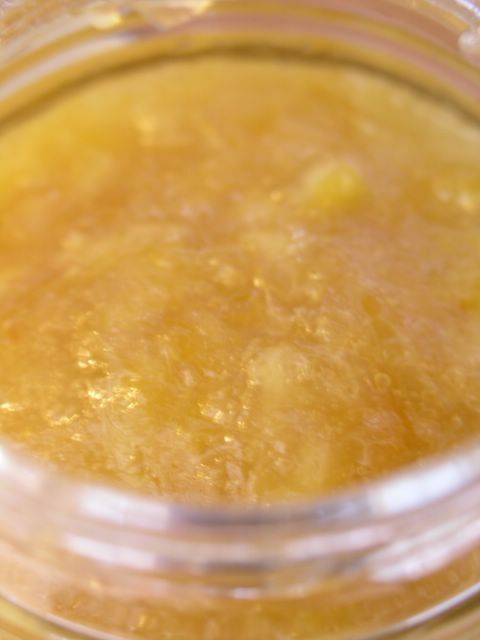 It's made with a lot of lemons, and after the cordial was done, he used a stick blender to cut up the lemons, added sugar, and boiled until it was marmalade. Amazingly easy - or so it sounded. It's delicious on toast, or on crackers. Yum. Thanks dad! I know, I am! Dad is really good in the kitchen - he doesn't cook a lot, but when he does.. mmm. I love lemon so much--this sounds divine! Although I have no experience with elderflowers--either tasting or cooking. What kind of flavor do they impart? Bix, I'll have to ask my dad how he does it. I think it's really simple (something like elderflowers, lemons and water, and.. sugar. Loads of sugar) but I'll ask for quantities! Here in germany it's nearly impossibble to find elderflower cordial. And if, then mostly with lots of additives which tend to destroy its delicate flavor. So I'm very much looking forward to your recipe.